The Ponte Vecchio in Florence, the most famous bridge in the world? The Ponte Vecchio (translated: Old Bridge) is with the Rialto Bridge in Venice probably the most famous bridge in Italy and according to some sources the most famous bridge in the world. The bridge Ponte Vecchio connects the city centre of Florence with the districts on the other side of the river Arno. On the bridge, the shops on the left and right give you the feeling of being in a normal street. Only in the middle of the bridge the row of shops is interrupted for a few meters. From here you have a wonderful view on the river Arno with some other old bridges. On the few meters on the Ponte Vecchio with a clear view there is always a big crowd. Hundreds of tourists, many of them from Asia, want to take photos and selfies. 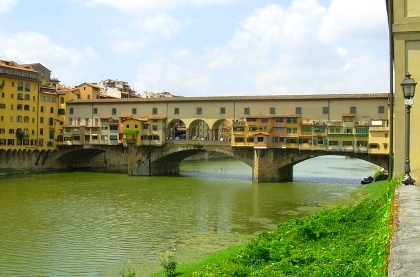 In China, Japan and South Korea the old bridge in Florence seems to be even more famous than in Europe. 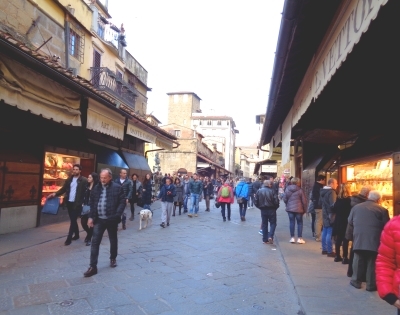 There are about 20 shops on the most famous bridge on earth Ponte Vecchio. Almost all of them are jewellers. Especially high-quality jewellery made of gold and silver is offered. The prices of many pieces of jewellery in the shop windows are often 4 digits, some are even more expensive. Some shops also sell wristwatches, especially first-class brands with high prices like Rolex. The Ponte Vecchio in Florence is one of the oldest bridges in the world, built using the segmental arch technique. Probably in 1333, another wooden bridge was destroyed in this place by a flood. Then the present stone bridge was built. The opening of Ponte Vecchio was in 1345, when there were already small shops on the structure over the river Arno. In the beginning there were butcher’s shops in most of the shops. Duke Medici Cosimo I expelled the butchers who threw their stinking waste into the Arno from the bridge shops. Goldsmiths and silversmiths then moved into the shops on the most famous bridge in the world. 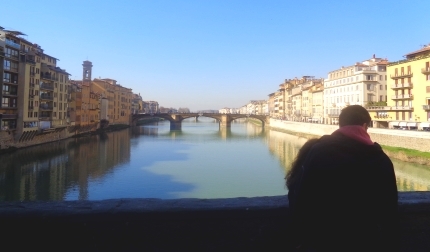 Very close to the Ponte Vecchio (less than 10 min walking) are many sights in Florence like the Uffizi art gallery, the Old Palace Florence or, on the other side of the river, die Palazzo Pitti. After starting the video, you can rotate with the mouse in any direction (including up and down).